Do you have a problem of network card detection on RHEL 7.1 which is hosted on VMWARE Workstation. Even i have tried uninstalling open-vm-tools and installed vmware-tools, but everything was failed. Some of you may have seen the issue during the initial installation of RHEL7.1 anaconda reported "no network connection available" or after the Installation. Modify the guest's configuration .vmx file and append the entry for each ethernet card you have installed. 1. Shut down the virtual machine. 3. Open the virtual machine's configuration file (.vmx) in a text editor. 5. When finished, save the changes by using the save option in the text editor. 6. Exit the text editor. The examples are based on the first Ethernet card in your system, referenced by eth0. If your system uses more Ethernet network cards, then replace the number 0 (of eth0) by the number that references your Ethernet card. 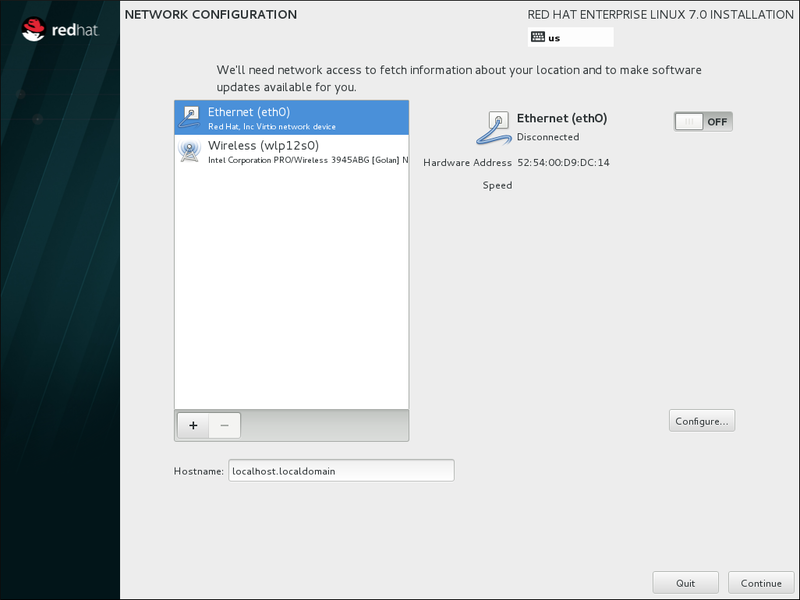 Power On the Guest OS RHEL 7.1, Now you can Identify the name assigned to the First Ethernet interface, using ip command. Create a standard network card config file.